Sabatino Bertone first appears in the Painesville, Ohio, area in 1911. He migrated to Painesville from Conneaut, Ohio, in 1911, with his brothers Liberato and Giovanni. 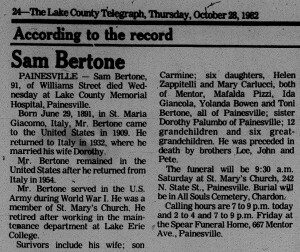 In America, Sabatino Bertone was known as Sam Bertone. 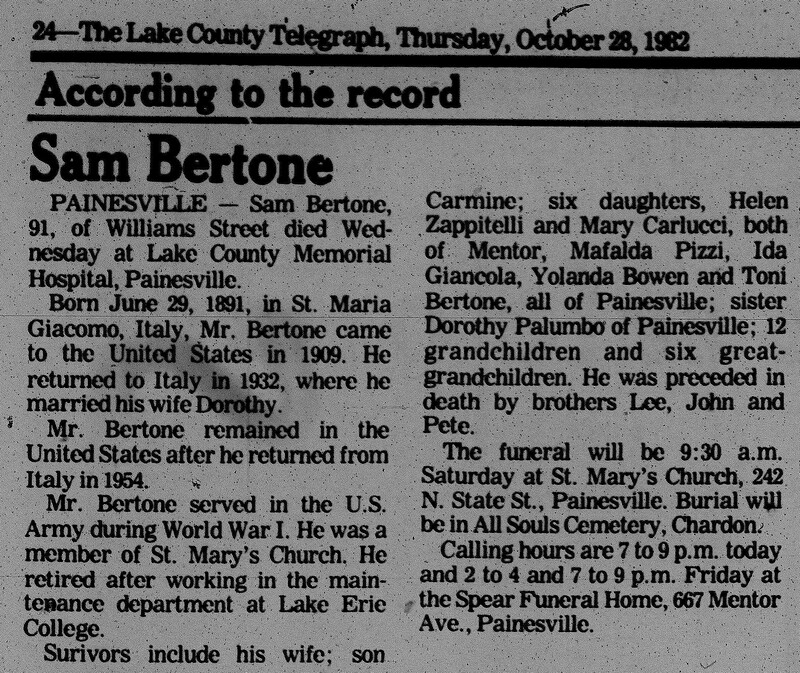 Sabatino Bertone, son of Nicola Bertone and Maria Giancola, was born on June 27, 1891, at Santa Maria Giacoma, Italy. He married Addolorata Notte, daughter of Domenico Notte and Immacolata Fabrizio, about 1922 at Italy. Sabatino died on October 27, 1982, at Lake County Memorial Hospital, Painesville, Lake County, Ohio, at age 91. His body was interred at All Souls Cemetery at Chardon Township, Geauga County, Ohio. Sabatino Bertone, age 17, immigrated to the United States on March 29, 1909. He became a citizen of the United States in 1911. Sam Bartone registered for the World War I Draft on June 5, 1917. He was living at 633 North State Street, Painesville, Lake County, Ohio. Sam was employed by Fred W. Harmon as a basket maker. Sabatino returned to Italy in 1932 to raise his family. Sabatino reentered to the United States, with his family, on September 16, 1954. At the time of death, Sabatino resided at Williams Street, Painesville, Lake County, Ohio. He was a retired workman for Lake Erie College. 1. Helen Bertone. She married Michael Zappitelli. 2. Maria Bertone. She married John Carlucci. 3. Mafalda Bertone. She married Michele Pizzi. 4. Yolanda Bertone. She married Dale Sprague. 6. Carmine C. Bertone was born on November 27, 1929, at Campobasso, Italy. He married Yolanda Ferrara about 1949. Carmine died on January 30, 2004, at LakeEast Hospital, Painesville, Lake County, Ohio, at age 74. His body was interred at Riverside Cemetery at Painesville, Lake County, Ohio. 7. Ida N. Bertone was born about 1937, at Santa Maria Giacoma, Italy. She married Joseph Giancola. Ida died on January 22, 2013, at her home, Painesville, Lake County, Ohio. Her body was interred at All Souls Cemetery at Chardon Township, Geauga County, Ohio.